Happy Holidays from Coventry Carpets! Sending best wishes to you and your family during the holidays. Here is a quick tip in case of a Holiday party wine spill on your carpeting. Perhaps you are having a Christmas dinner and a crazy uncle is getting a bit tipsy and his wine glass tips over spilling on the carpet. What should you do? As soon as wine is spilled on your carpet get a clean rag and put it over the spill and apply pressure to blot up the wine. Keep blotting the wine up with clean towels until you cannot absorb any more wine. Then get a damp cloth, with cold water so the stain does not set in, and blot until no more is visible on the towel. Soak up and blot the spill area. Leave solution on 5 minutes or more. Rinse with cold water; cover with white paper towel. 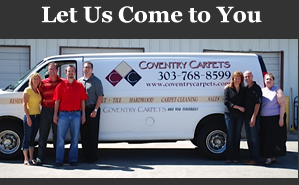 If you are in need of new carpeting give us a call to schedule an in home appointment with our mobile showroom. Coventry Flooring provides a lifetime installation guarantee on all of our work!